We had a bit of a lazy day on 8th November. 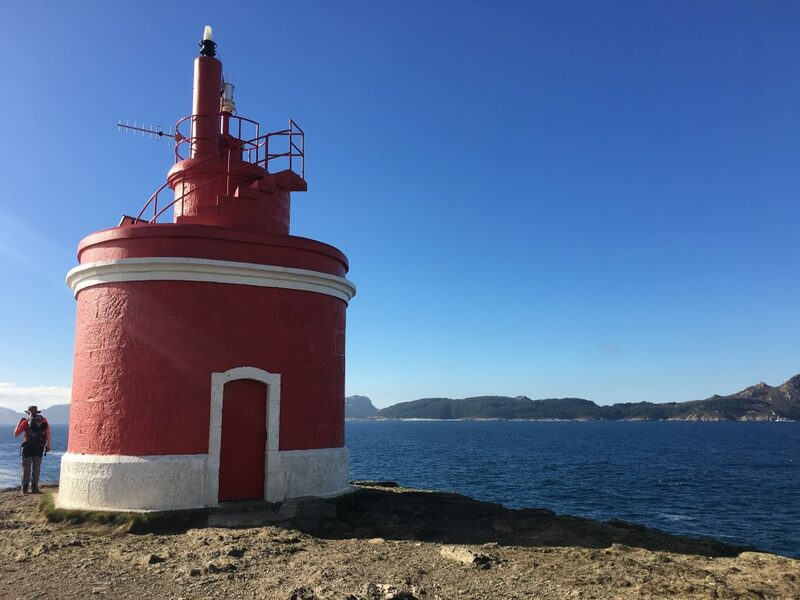 For some reason we just couldn’t get moving and our plans for a bike ride ended up with us driving around the hills and coast near Pontevedra and stopping to take in views or short strolls without doing very much at all. 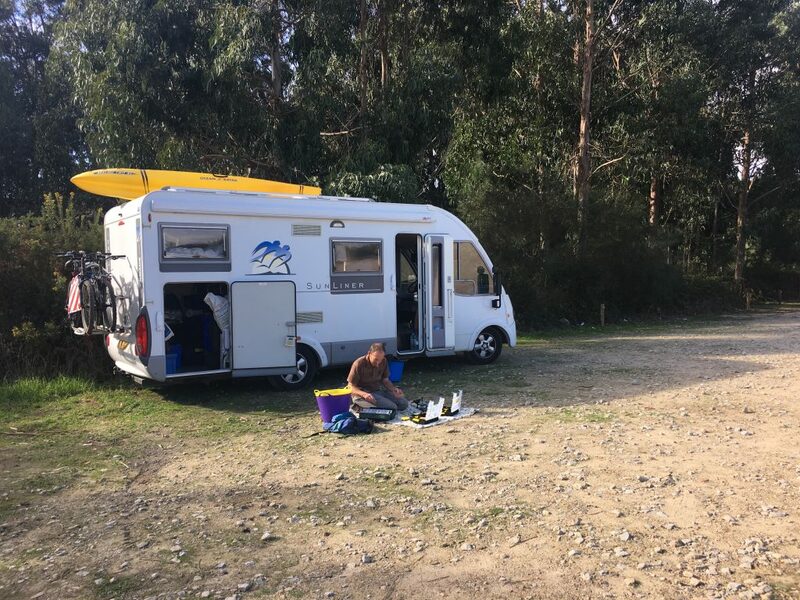 We spent the night at the Memorial Park aire near Poio where we walked around the bay and encountered eucalyptus trees in abundance. These trees, native to Australia, have been planted in Spain and Portugal to provide quick growing timber for the paper industry and this was the first time we had come across them in quantity; their alien charm, with their constantly peeling bark, silvery leaves, and odd flowers, quickly becomes wearing when you realise they are on their way to becoming a monoculture and ousting the native flora. 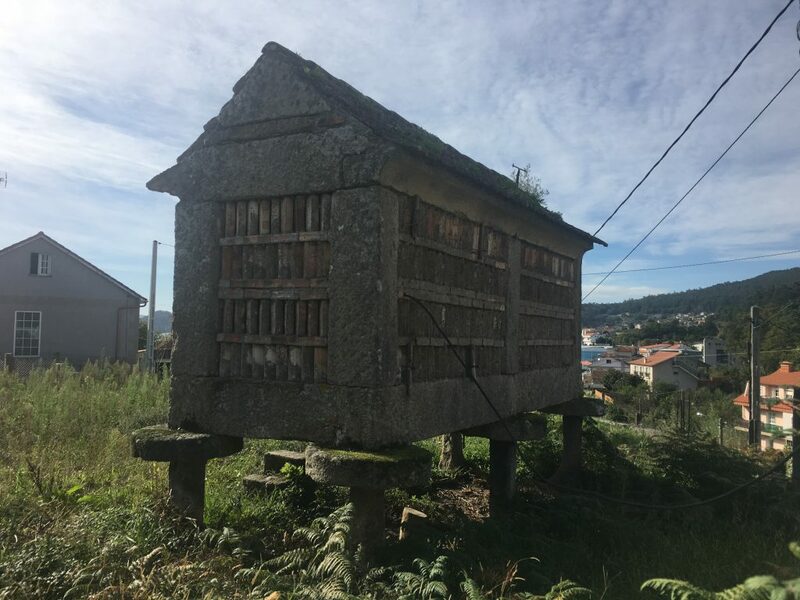 We saw these grain stores in gardens and smallholdings all round Galicia, well ventilated and up on stilts to protect from vermin. The following morning we decided to go into Pontevedra in search of a large supermarket as we needed to do a proper stock up. There were two Carrefore supermarkets, the first only had a tiny outdoor parking space that was completely full. The second had an empty outdoor parking area but we didn’t spot the sign on the way in that told us the only way out was through the underground parking. Bertie wasn’t getting through there! Given that we were already in trouble we decided we might as well do our shopping anyway and so, with full fridge and cupboards, we tackled our predicament. I donned my hi-vis vest and went up to the top of the entrance to stop the traffic in a semi-official way while Paul drove the wrong way up the one way ramps. Apart from a case of mild embarrassment it was remarkably easy. From Pontevedra we drove south west out to the end of the next peninsular. 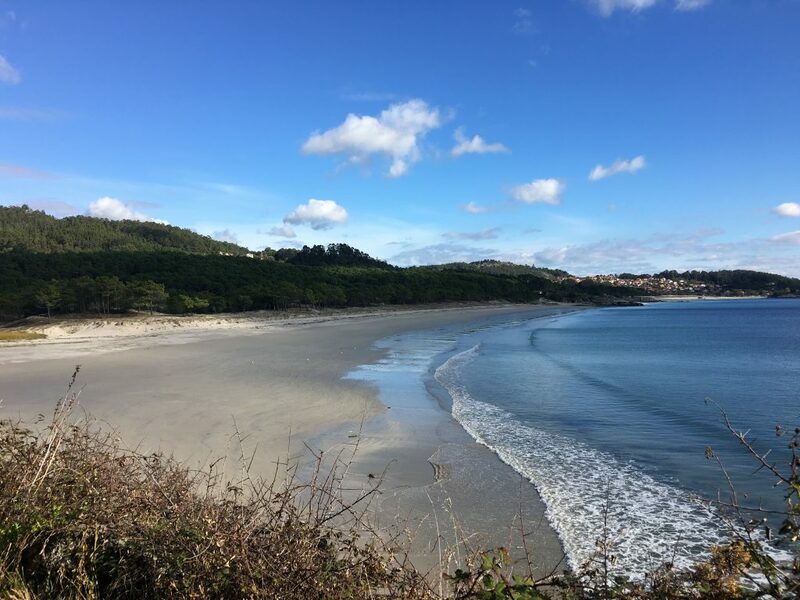 Galicia’s coast is indented with a number of ‘rias’, these sloping sided inlets are like gentle fjords and between each ria is a peninsular, more populated inland, and wilder and more rugged as you reach the seaward end. The Dunas de Corrubedo had been at the end of one of these peninsulas and we were now heading for the Praia de Melide where there was a large parking area south of the village of Donon. We had another falling out with the sat nav which took us through smaller and smaller streets in tiny villages until Paul said quite firmly ‘I’m not driving down there’. We knew there was an easy way there because we had seen it on google maps, but the sat nav just couldn’t direct us and by the time we knew we were going wrong we didn’t have great signal. We retraced our steps back to a ‘main’ road and a point where we had signal so that we could pick up the route on google maps and ignore the sat nav. We finally made it to the village of Donon where we stopped for restorative tea and cake before tackling the remaining couple of miles off road to the car park. Bertie did admirably avoiding ruts and potholes and finally parked up in the sunshine. We spent the next hour or so doing a few chores before exploring the beach and cliffs near the carpark. 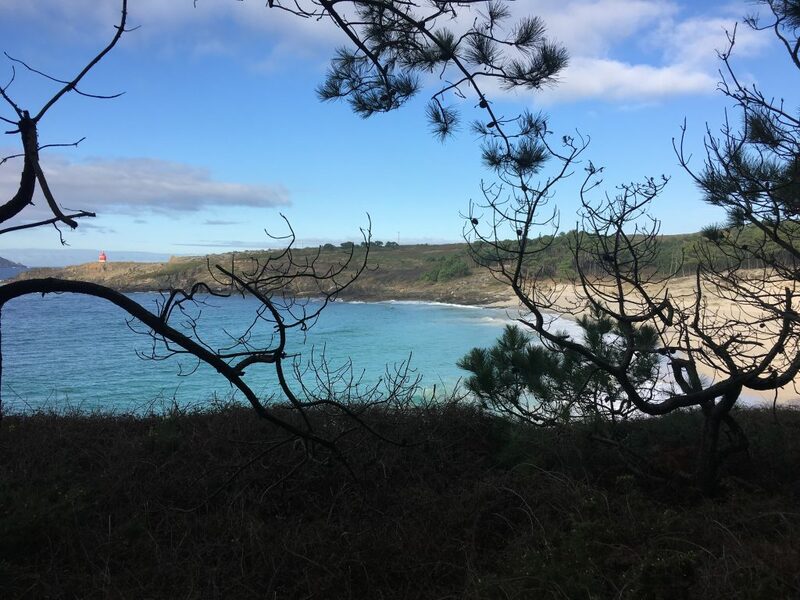 The low cliffs were ideal for fishing and so I read and sunbathed while Paul fished for mackerel – he managed to catch one, but it wouldn’t make a meal so I gutted it and put it in the fridge, hopefully to be joined by a second one the following day. 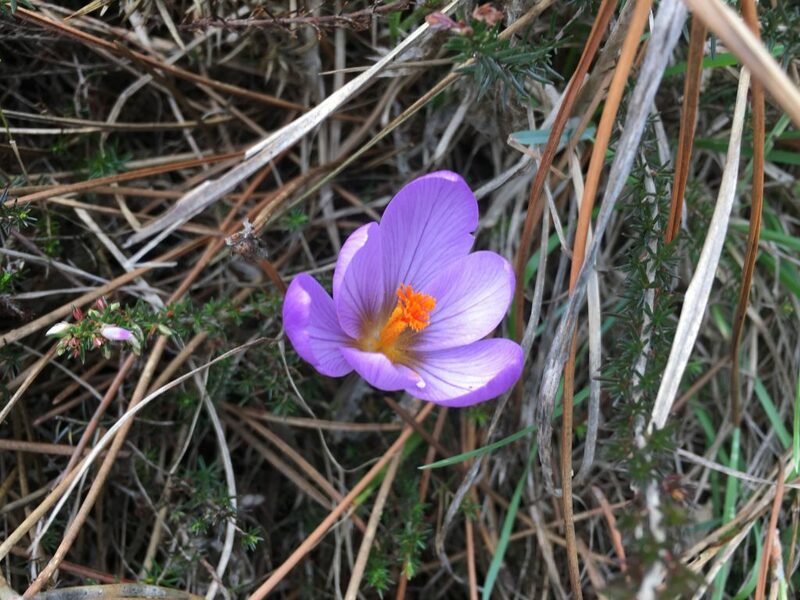 We saw many autumn crocuses flowering between the trees. The next morning we decided to walk around the headland, we started by walking out to the first of three lighthouses Faro de Punta Subrido before heading back across the beach to lighthouses two and three – the particularly attractive squat red Faro de Punta Robaleira and the more standard Faro de Cabo. From here we followed rough tracks north as far as possible along the Atlantic side of the headland with large waves crashing against the rocky cliffs, at one point we descended by an awkward and steep fisherman’s path to a tiny beach where the incoming tide quickly chased us back up again. Eventually the steep cliffs forced us back onto the main track we had driven down the previous day and we walked into Donon. 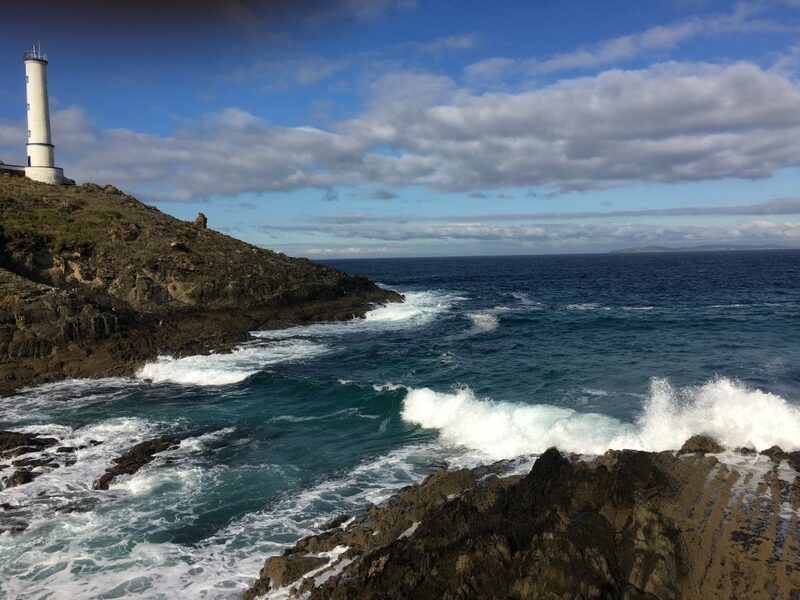 From Donon we dropped down to the Praia de Barra, a large and deserted beach where we gathered large mussels from the rocks before taking cliff-side paths back towards our parking spot. Empty beach at Praia de Barra, we collected mussels from rocks that were at the end of the beach we took this photo from. Paul decided to do some more fishing from the same spot as before, but no luck this time. 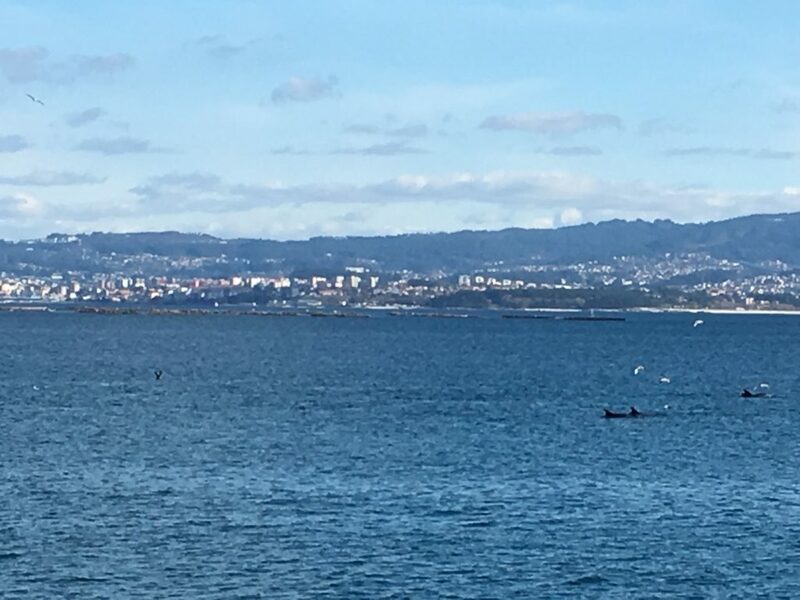 We did see dolphins in the bay though, which made up for (and probably explained) the lack of fish. The large pod, including some mother and calf pairs took their time as they swam past us on their way out to sea. 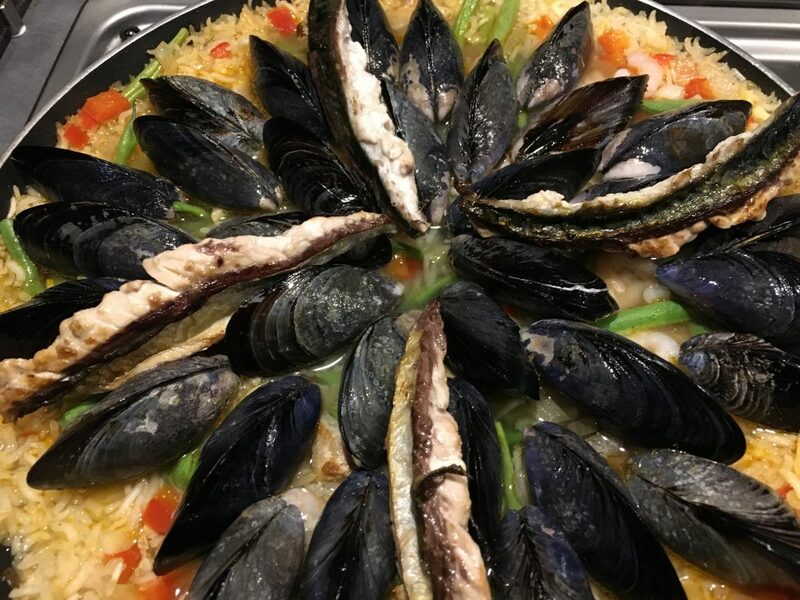 That evening I cooked the mussels and solitary mackerel in a rice dish that I hesitated to call a paella after hearing some very sarcastic comments on Spanish radio earlier that week (not that I’m fluent in Spanish but when you hear the words Jamie Oliver, Chorizo and Paella alongside derisive laughter you know that something negative is being said). Whatever the dish was, it was very tasty and the mussels in particular were luscious and juicy. It’s always a bit of a gamble to eat shellfish gathered from the shore and we do take some care, but you never know. No side effects this time though so good news. The following morning we left the carpark. There was a one way system for car park access, so we had to drive up a different track than we had come in…at first…until we got to the point that the road was rippled with foot deep undulations. I don’t think I’ve every seen anything like it, they weren’t potholes or ruts, but were running across the road and there was no way we would get across them without ripping something out from Bertie’s undercarriage. Paul reversed us back to the car park and for the second time in a couple of days we were driving the wrong way up a one way street. Luckily we had made an early start and we didn’t encounter anyone coming the other way.